Religious-Zionist group hopes 'to make Israel more Jewish'; Rabbi David Stav cites unprecedented thirst for Judaism. The religious-Zionist Tzohar rabbinical organization held its annual summer conference in central Jerusalem Monday. Hundreds of participants and dozens of rabbis, academics and other experts gathered from around the country and even abroad to attend the event at the Binyanei Ha'uma Convention Center. The conference, titled "Talking About What's Important To You", began with a special prayer for the soldiers of the IDF, as they fight to protect the citizens of Israel from Gazan terrorist groups. A prayer was also said for the residents of southern Israel, who bear the brunt of the deadly rocket fire launched against Israeli population centers by Hamas and Islamic Jihad. Tzohar Chairman Rabbi David Stav, Education Minister Rabbi Shai Piron and Ashkenazic Chief Rabbi David Lau were all in attendance. 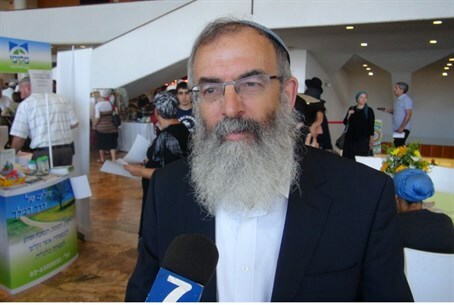 Speaking to Arutz Sheva Rabbi Stav said that he had witnessed a growing thirst from Jewish Israelis to connect with their Jewish heritage, and noted the countless requests for tzitzit and other religious items from soldiers serving on the front lines. "We are very happy to see that more and more people are interested to leave aside their daily issues and to deal with something that is more for the spirit and something that is more for the future," he said. "The main challenge on the national level of Tzohar is to make Israeli society more Jewish... to make them feel more connected, to make them feel that their Jewish heritage is relevant and is meaningful for them." Lecture topics ranged from education, marriage and parenting, to more controversial subjects such as conversion and feminism. Speaking at the conference, Education Minister Shai Piron hailed the remarkably national unity exhibited by Israelis during recent months of crisis, and called on the public to preserve that sense of unity. "There is a price to pay for unity, and sometimes it requires us to make compromises" to include the views of others, he said.